Online casino 888.com has announced a new celebrity face at their poker tables, that of famous Australian cricketer Shane 'Warney' Warne. Warne has signed an exclusive sponsorship to be captain of the 888.com Australian Poker Team, and is also slated to participate in several poker tournament events throughout the year. Sport enthusiasts the world over know of Warne's accomplishments, records, and awards as a bowler. 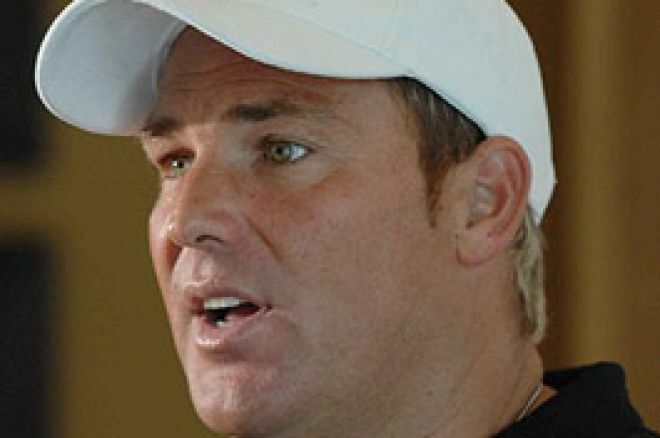 Some of Warne's awards include Wisden Cricketer of the Year in 1994, One-Day International Player of the year in 2000, and Test Player of the Year in 2006. Warne was also selected as one of the five Wisden Cricketers of the 20th Century. Warne retired from the game of cricket after his 2006-07 series. 888.com announced that Warne will be seen playing their online tables while warming up for bigger events in the future. Warne will also join the ranks of celebrity bloggers by adding his dose of chatter to a poker blog, to be found at 888poker.com. The poker blog is planned as a diary of his experiences as the captain for the 888.com team. Warne is no stranger to writing about his experiences, as he is credited as co-author of three books: Shane Warne: My Official Illustrated Career, The Complete Shane Warne, and Shane Warne: My Own Story. 888.com announced that Warne will be leading his new poker team into four major events: the New Zealand Poker Champs; the 2008 World Series of Poker; the United Kingdom Poker Open; and the Poker Nations Cup. The Poker Nations Cup was sponsored by 888.com in 2006, and featured six nations' teams, with six members on each team. Each team has a captain, who is responsible for choosing which player will compete in each round of the event (six rounds total). Previous captains for the PNC include Dave 'DevilFish' Ulliott, Martin Wendt, Michael Keiner, Noel Furlong, Ken Lennaard, and Robert Williamson III. After conquering the sport of cricket, Warne appears to be ready to make a large splash in the world of poker. With four major tournament events scheduled already, 888.com plans to release more details about additional competitions Warne will be competing in the near future. Latest review of PacificPoker by Tony G.